Need a day off? Then lace up your golf shoes and practice your putt, the Chamber Golf Tournament is coming! 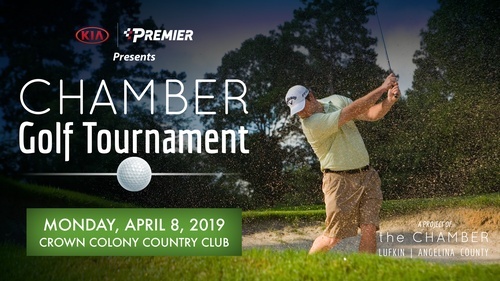 Join the Lufkin/Angelina County Chamber of Commerce on Monday, April 8th at Crown Colony Country Club for the Chamber Golf Tournament presented by Premier Kia. Teams consist of four members with a $500 entry fee. The event is a full scramble format with team scoring and a shotgun start. Take part in contests such as the putting contest, closest to the pin and longest drive awards. A Hole-in-One at the 17th hole wins the All-New 2020 Kia Telluride EX from Premier Kia. The day concludes with hors d’oeuvres, golfer awards, and door prize drawings. You won’t want to miss this fun opportunity! Lunch is provided and refreshments are available on the course throughout the day. The registration deadline is Friday, March 29th. For more information about this event, please contact Tara Hendrix at 936-634-6644 or THendrix@lufkintexas.org or visit us on our website at www.lufkintexas.org. Thank you to our Chamber Golf Tournament Sponsors! Presenting Sponsor, Premier Kia; Gold Sponsor, Whataburger; Cap Sponsor, Crown Colony Country Club; Golf Towel Sponsor, Servpro of Lufkin/South Nacogdoches County; Media Sponsor, KTRE TV 9; Driving Range Sponsor, McFarland Cascade; Snack/Beverage Cart Sponsors, Little Caesar’s Pizza; Hole Sponsors, Allen Loggins & Sons, Buffalo Wild Wings, Carroway Funeral Home, Etech, Pepsi Bottling Group; Servpro of Lufkin/South Nacogdoches County.